For the really picky bride who requires something totally different and needs to be the talk of the town for weeks to come, we humbly suggest this rubber glove wedding dress. Yes, you read that right. 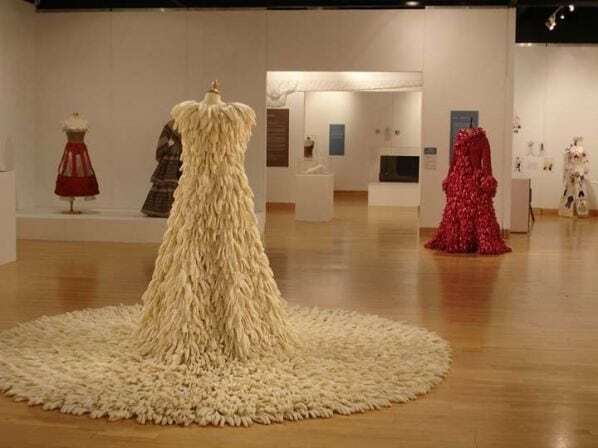 This unique and exclusive gown was “designed” and created by Susie MacMurray who made it out of 1,400 rubber gloves turned inside out. Believe it or not, Ms. MacMurray is actually an acclaimed artist. Her work was displayed in London at Agnew’s Gallery and included her drawings, sculptures and sensational clothing. It should come as no surprise that she was a classical musician, but retrained as an artist, graduating with an MA in Fine Art in 2001. This dress simply “sings” class act.